Look at that little sticker on the back of this San Jose taxi: CNG. So that’s a natural gas powered taxi. How odd. Why is this taxi burning cleanish fuel while the next dozen are using the usual gasoline? I heard a rumor it has something to do with the San Jose airport, or maybe it was SFO. That CNG taxis could go there every day while others only every other day. True? Is this San Jose being more green than San Francisco too? Might there be a SJ vs. SF rivalry after all – on the environmental front even? Better yet, do you know a CNG taxi driver or ridden in one? Was it different? Or cheaper? Or did you even care? Um… aren’t there a lot of CNG cabs around SF? I see them fairly often. I took one into the city from the Oakland airport, and it was just like a normal Crown Vic. Seemed to have less trunk space than the typical three-or-more-dead-mafia-informants size though. I believe awhile back the State of California began to require a percentage of fleet vehicles, garbage trucks, buses, and taxis to use Compressed Natural Gas. The San Jose Airport has a Natural Gas station out near the car rental lot. It is for taxicabs and the public. There is less trunk space after the cabs are fitted with the tanks, so I did not get one for my Yellow Cab van. The San Francisco International Airport, in partnership with the San Francisco Taxicab Commission, allows drivers of CNG taxis a front-of-the-line incentive allowing them one jump and one trip fee waiver per shift. Now that’s a great incentive for taxis to go CNG. Would be good to see more like that. 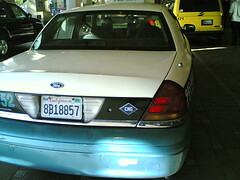 In my dozen or so taxi rides around SJ and SF, this one at the hotel was the only I knew to be CNG. Of course it’d be better if they were Pirus taxis or if I didn’t have to take them to begin with. The whole Silicon Valley was particularly pedestrian unfriendly.